While my diet in January was very very good, it was really really bad in February. Unsurprisingly, the main culprit was chocolate! It wasn't unusual for me to have 3 bars a day some days, especially on days where I was running a lot of miles. This just won't do so I've decided to impose a complete ban on all things choclatey! It has worked for booze and I still haven't touched a drop since August 29th 2008. While I'm on, I'm adding crisps and Bacon Sarnies to the list of no go foods. Just like chocolate, the need for salty crisps after a long run was great! There's really little else wrong with the food that I eat. Katy still cooks very healthy things for tea and this has been the case for a long while now. In fact, just today she made some cracking home made roast parsnip and onion soup. After 20 steps it was just the ticket! I'm going to look further into improving things with less bread and more pasta (wholemeal pasta of course). I haven't had chocolate, crisps or a bacon sarnie for 4 days now and there are 70 miles to run in training next week! The benefits and drawbacks of the improved diet will be seen very soon. In the meantime, there is absolutely no chance of a crumb of chocolate passing between my lips! There, I've said it! 20 is the new 12. After a tough Beach Bootcamp session it was onto the steps with the usual gang in attendance. One by one they did their efforts until all that was left were Peter McCowie (pictured left) and myself. Peter's final total was 16 and I managed a new best of 20 (previous best was 12). Well done to one and all for completing their steps. Improvements are seen week after week from everybody who attempts the steps and David Fairlamb must be very pleased with the effort we all put in. I must say that my day was made when I read the following message from an old colleague mate. For me, this is what it's all about and it's nice to see the run across the USA starting to have an effect on others already. This is one of a few message, stories or comments I've heard of recently. Just gotta say that you've been a bit of an inspiration for me over the last few months. I started to get myself fit last June and spend a lot of time in the gym, but recently I've been doing something which I've always found difficult and that's running. Being of 'chunky' build, it's no mean feat I can tell you! I started with a struggling 2 miles last October but last week I did a 7 mile run and I'm gearing up for the big 10 miles tomorrow. Even at my fittest I could only manage about 3 miles so I feel like I've achieved a lot lately. In total, I've lost around 3.5 stone since June and most of that came off when I started running. It's unheard of, but I really enjoy running now and find it relaxing, especially at night, I can listen to my iPod and think without any disturbance. I'm thinking about the Great North Run as a landmark now and it would be great to run it with confidence. Keep up the hard work mate, I enjoy reading about your progress.". So if you're wanting to lose a few pounds, why not take a leaf out of John's book. All it takes is a pair of trainers, a mile or 2 of road/path and the desire to put one foot in front of the other a few hundred times! Run people run! After tomorrow's Beach Bootcamp session I will be tackling the steps as per usual. As per last week, there is no long run to be done afterwards so the aim will be to get up the steps as many times as is physically possible. I'm hoping for at least 20 times which is 7 more than my previous best. Watch this space for news on how I get on tomorrow! Monday 16th February - 5 mile run, Race Course. (00:46:46). Tuesday 17th February - 5 mile run, Race Course. (00:42:44). Wednesday 18th February - 5 mile run, Treadmill. (00:42:36). Wednesday 18th February - 8.4 mile run, Havannah Nature Reserve. (01:17:13). Thursday 19th February - 5 mile run, Race Course. (00:39:41). PB! Thursday 19th February - 5 mile run, Treadmill. (00:44:10). Friday 10th February - 15.75 mile run, Race Course. (03:02:37). Saturday 21st February - Beach Bootcamp. (00:45:00). Saturday 21st February - 12 x run up the steps. (00:26:12). 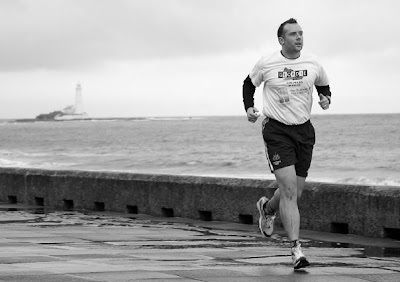 Saturday 21st February - 9.4 mile run, Tynemouth to St Mary's Lighthouse and back. (01:31:15). Sunday 22nd February - 6.5 mile run, Treadmill. (01:03:13). Very close to a successful week 16! Once again I have put words into action and after a sterling effort this week I've managed to get 49.15 miles in so far. Trainer and mentor Mark Fleming (pictured left) was in touch yesterday offering advice and encouragement and we are both hopeful I can reach the target of 65 miles this week. I'm writing this, early on Saturday morning and there is little physical evidence that I ran home yesterday. I'm really pleased about that and that tells me a lot about my ability to recover. It was a cold and wet 15.75 miles from Gosforth to Shotley Bridge and I ended up running in the dark. 2 years ago when I was training to run from John O'Groats to Lands End these distances and conditions were very new to me. Now, however, it's just part and parcel of a day's running. I've developed an attitude of "just getting on with it" no matter what the weather wants to throw at me. Getting the mileage done is the main thing. I'm not that fussed if it's done in rain, snow or shine. As it happens, I wore only 1 layer (a Run Geordie Run t-shirt of course) for an 8.4 mile run on Wednesday in very mild conditions. On Thursday, I recorded a PB for 5 miles of 00:39:41 (I put it down to the new Brooks trainers). I hadn't set out to do a PB but when you are in such esteemed running company as Jeff Oliver, Carlton Fletcher, Patrick Aynsley-Smythe and Carl Hudson you just tend to get a bit carried away. It is at this point where I say "I'll not be beating that one for a while"! And so to today, where I will be on Tynemouth Beach at 9am for the regular Beach Bootcamp workout (Pop down if you fancy it). This will be followed by a sensible amount of efforts up the steps in King Edwards Bay. I managed a new record of 12 last week. As with previous steps efforts during my "running weeks" I'm anticipating a very tough time of it. It's not going to be pretty! Any energy I have left after that will be used on an 8.5 mile run from the Grand Hotel to St Mary's Lighthouse and back. That will leave 7.35 miles to be done tomorrow to make 65 for the week. Wish me luck! Monday 9th February - Personal Training Session. (01:30:00). Thursday 12th February - Personal Training Session. (01:30:00). Saturday 14th February - Beach Bootcamp. (00:45:00). Saturday 14th February - 12 x run up the steps. (00:29:31). PB! In August 2007, Newcastle United invited me to run a lap of honour, following the successful 874 mile run from John O'Groats to Lands End. A photo from that event (pictured right) has been entered into a competition at the lgloop.com website. The photo with the most votes has a chance of winning £1000. You can see where this is going can't you! If the photo wins then, by my calculations that would be £500 for St Benedict's Hospice and £500 for The Children's Foundation. This is where I need your help folks! You can vote by logging clicking here at www.lgloop.com/images/2910. You'll need to register a user name before voting but is costs nothing other than your time. Once you've done that, why not tell all of your friends to do the same too. Thanks in anticipation of your help. Tuesday 3rd February - 6 mile run, Jesmond Dene. (00:55:20). PB! Wednesday 4th February - 8.4 mile run, Havannah Nature Reserve. (01:12:16). PB! Thursday 5th February - 10.4 mile run, Havannah then Race Course. (01:42:20). Friday 6th February - 5 mile run, Race Course. (00:44:12). Saturday 7th February - Beach Bootcamp. (00:45:00). Saturday 7th February - 11 x run up the steps. (00:23:11). 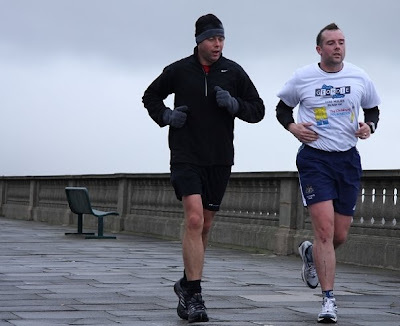 Saturday 7th February - 8.6 mile run, Tynemouth to St Mary's Lighthouse and back. (01:21:05). Sunday 8th February - 17 mile run, Shotley Bridge to Rowlands Gill and Back. (03:21:53). Very close to a successful week 14! At the time of writing, I'm 16.7 miles short of this week's target of 60 miles. This isn't bad at all considering the weather we've had and I've got every chance of meeting what is most certainly a very challenging target. After today's regular Bootcamp and steps session, Mark Fleming and I went for a 8.5 mile run to St Mary's Lighthouse and back. I also used this opportunity to get some professional photos taken for sponsor's Brooks Sports website. Local photographer, Fraser Scott, took time out of his busy schedule to take some most brilliant pictures (pity I'm in them!). I've seen some of his previous work before and was keen to get him down to Tynemouth to take a few snaps. I must say that the work I've seen of some of the weddings he's snapped is nothing short of stunning. If you're in need of a photographer's services then Fraser is your man! Anyway, tomorrow will see me head into the very snowy Pennines for those final 16.7 miles. It's going to be colder than today so my tracksuit bottoms may get a rare outing! Thankfully, next week is a low mileage week and I have 2 sessions with Mark Fleming. After I told him what I've eaten this week he's promised to push me to the limit! Great! Without a tour fund the USA 2011 run is simply not going to happen. Thankfully, I've been saving as much as I can for the last 6 months and I'm well on target to have the required funds (exchange rate permitting) in place by the end of 2010. 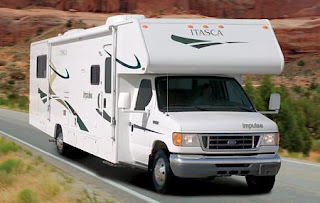 The job of trying to come up with an accurate costing won't happen until the end of this year but I'm currently aiming to have £15,000 in place to cover things such as mobile accommodation (pictured), air fares, fuel, insurance and food. I'm currently just short of 1/3 of that figure and I'm keeping my fingers crossed that the exchange rates improve between now and 2011. The fund will receive a boost in the School's Summer holidays when I start cycling to and from work and put aside the saved petrol money. I also plan to have 2 fund raising evenings this year and next where the proceeds will be split between the Tour Fund and the charities. Watch this space for further info. I also hope to attract some commercial sponsorship and will start working on that in the Summer. As you can see, this run will come at a great personal cost but the rewards for the 2 charities could be massive. I don't like setting targets but I don't think that £75,000 is an unrealistic sum of money to raise for an event of this magnitude. I once set a target of £5,000 for the John O'Groats to Lands End run in 2007. That event ultimately yielded £34,108. The USA 2011 run is 3.5 times the distance. It would be nice to raise 3.5 times the money for St Benedict's Hospice and The Children's Foundation. Those nice people organising the Chevy Chase say "YES"! Last month, well respected and accomplished ultra distance runner Ian Harding asked me to join a team of runners from Northern Rock to take part in this year's Chevy Chase up at Wooler on July 4th. 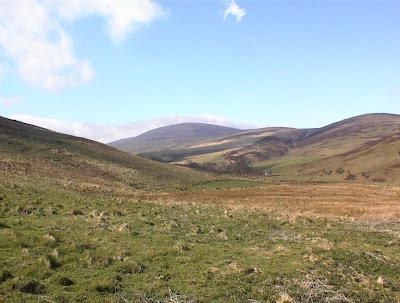 As the Wooler Running Club website explains "The Chevy Chase is a 20-mile journey through some of the finest upland scenery in Northumberland giving both walkers and runners the opportunity to channel their energies into a rewarding and demanding personal challenge. You will need to be fit and sure footed, determined, and prepared for all weathers. Your route will take you deep into the heart of the “land of the far horizon”; you will summit both Cheviot 2676 feet / 815m and Hedgehope 2348 feet / 714m. You will have the unrestrained freedom of the hills, the route is unmarked and you may choose your own path as long as the manned checkpoints are visited in the correct order. Only a short section is on road; the rest of your route follows tracks, footpaths, sheep paths and crosses rough fell. Although taking place in mid summer the sun is never certain to shine and low cloud is a distinct possibility therefore you must be able to navigate by map and compass.". I didn't hesitate in applying for this prestigious race and I'm delighted to be one of the 300 accepted entrants. Preparation for this run will include a lot of hill work in the North Pennines. This will be ideal for improving the strength and stamina needed to tackle not only the Chevy Chase but also for the longer runs I'll be doing from the Spring time. Further info on this run can be found at Wooler Running Club's website. Blood, sweat but no tears in week 14. Training is going very well this week with 30 miles done and 30 miles still to do. The highlight of the week so far has been a PB of 01:12:14 for the popular 8.4 mile route up to the Havannah Nature Reserve. This was Wednesday's run and it wasn't without incident! About 5.5 miles into the run, I tripped on a stone jutting out of the ground and went flying! 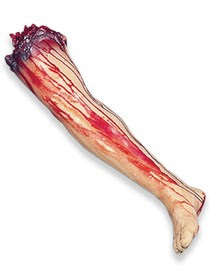 My leg was in a right state with a steady stream of blood pouring down the front into my trainers. I picked myself up and managed to put in some quick final miles to register yet another PB. This was not only down to adrenalin but Carlton and Jeff's fine pace setting. I should be at 40 miles for the week by this stage but the snow and ice around Shotley Bridge and a few more unplanned school runs have put paid to that. A repeat of today's 10.4 mile run tomorrow lunchtime will see me break over 40 miles for the week, leaving 20 to do this weekend. I've got every chance of getting the planned 60 miles in and this will mean I can enjoy next week's gym classes and cross training all the more. Thanks to recent t-shirt sales and a generous pledge from Northern Runner, who are now the main sponsor of this blog, the fund has gone over £2000! Northern Runner will be making a pledge each year up to the run and their support is very much appreciated. It's brilliant to be writing about a sponsorship landmark so early in the campaign and I'd like to thank all of those people who have bought a t-shirt or made an early pledge. In particular, I'd like to thank Peter McCowie for paying for the t-shirt production costs. This has allowed every penny of t-shirt sales to go to the 2 charities. I'd also like to thank Ivor Potter whose pledge of £1000 in August last year got the fund off to a great start. Rest assured everybody that I'm working as hard as I possibly can to make the run across the USA in 2011 as big a success as it can be. Believe you me, there is no greater feeling than handing a cheque over to a charity that means so much to me. 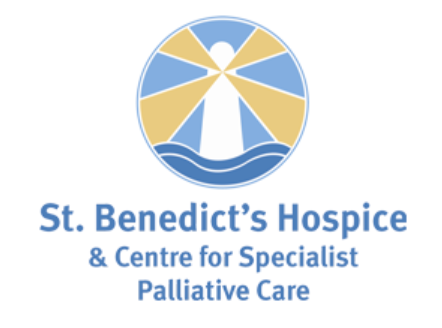 Both St Benedict's Hospice and The Children's Foundation carry out vital work in our wonderful region. It is your money that will help them continue to do so. Thanks everyone! I'm very pleased to report that the latest total for Run Geordie Run t-shirt sales is £670. Hardly a day passes without at least 1 being sold so expect this total to grow and grow over the coming months. Not only are the t-shirts getting the fund off to a great start, but they are also hopefully helping to spread the word about this next crazy adventure. They have been spotted as far south as London and as far North as Glasgow. As a show of appreciation, I'd like to ask all those who have purchased a t-shirt to send a photo of it being worn in far flung or unusual places. Perhaps on holiday or up a mountain or pictured with some page 3 models or something!!! The best snap will receive a fine booze hamper donated by various friends and colleagues. Closing date for entries is August 31st 2009. Please send all photos to sponsorship@rungeordierun.com. If you haven't already got a t-shirt then details on how to get your hands on one are available by sending an email to sponsorship@rungeordierun.com. They come in sizes S, M, L, XL and XXL and are priced at only £10. All proceeds go to the 2 charities; St Benedict's Hospice and The Children's Foundation. 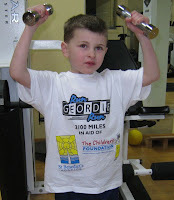 The t-shirts are screen printed for durability and feature the Run Geordie Run logo as well as those of the 2 charities. The details of the 3100 mile run are on the back of the t-shirt. All in all it's a cracking bit of kit to wear to the gym or just to knock around the doors in while supporting 2 excellent local charities. Monday 26th January - 4 mile run, Shotley Bridge to Ebchester and back. (00:40:31). Monday 26th January - Body Pump. (01:00:00). Tuesday 27th January - Boxercise. (01:00:00). Wednesday 28th January - Spinning. (00:45:00). Wednesday 28th January - Personal Training Session. (01:30:00). Friday 30th January - 5 mile run (400M efforts @ 07:20 pace), Race Course. (00:43:33). Saturday 31st January - Beach Bootcamp. (00:45:00). Saturday 31st January - 11 x run up the steps. (00:22:01).